We hope that you’re doing well, enjoying the fall season, and noticing that more men are sporting facial hair and a moustache (“mo”) in support of Movember to increase awareness for men’s health issues in November. We’re pleased to provide you with some of the latest Prostate Cancer News You Can Use . Titles of recent news articles are listed followed by a link to the Us TOO web page that provides access to the full text. You may also be interested in the following information. On November 6, we were in San Antonio, TX, for the Us TOO Panel Discussion & Webcast on Advanced Prostate Cancer hosted by the Us TOO San Antonio support groups. We’d like to thank support group leader Johnny Staha, everyone who attended in person and online, event moderator Dr. Juan A. Reyna, his wife, Joni Reyna, physician panelist presenters Dr. Eddie Morales, Dr. Vijay Gunuganti, Dr. Michael Liss, presenting sponsor Bayer, event sponsors Dendreon and Janssen Oncology, along with in-kind sponsorship from Los Padres. Watch the video of the event. Last week we were also in Englewood, NJ, on November 11 for the Us TOO Community Conversation on Prostate Cancer hosted by Us TOO International and Englewood Hospital and Medical Center, in collaboration with Us TOO support groups in Hackensack, Monmouth and NYC, and Cancer Care . We extend our thanks to local support group leaders Jack David Marcus and Joe Cavalli, everyone who attended the event, presenter Andrew Chesler from CancerCare, physician presenters Dr. Eric Margolis and Dr. Maxwell Janosky, presenting sponsor Bayer, event sponsors Astellas/Pfizer, Genomic Health, and Janssen Oncology, along with in-kind sponsorship support from Englewood Hospital and Medical Center. The event featured demonstrations for chair yoga, acupuncture and meditation as management techniques for anxiety and depression . Watch for video footage of the event coming soon! Remember that as a prostate cancer survivor or caregiver, you don’t have to go it alone . Exchange information and share your experience with others! 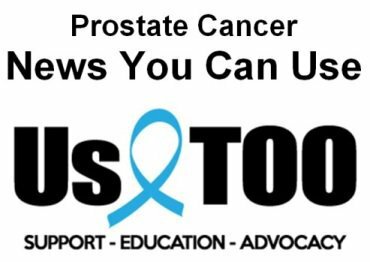 Us TOO has more than 200 prostate cancer support groups across the country . CLICK HERE to find a support group near you. CLICK HERE to log on to the Inspire online prostate cancer support community and participate in any of the 13 prostate cancer online discussion groups. Another option is to CLICK HERE to join a call-in prostate cancer support group . The Us TOO Prostate Cancer Clinical Trial Finder simplifies the process of identifying clinical trials by matching a patient’s profile with relevant clinical trials at no charge. Patient information can be entered online or on the phone by calling a toll-free number to talk with clinical trial navigators who speak English or Spanish! CLICK HERE to visit the Us TOO clinical trial web page , which includes more information and a link to The Us TOO Prostate Cancer Clinical Trial Finder. As you begin your online holiday shopping please remember to shop Amazon Smiles to help Us TOO. It provides all of the same merchandise on Amazon at the same price but designates a portion of your transaction to benefit Us TOO. Simply select Us TOO International as your charity of choice and 0.5 percent of the value of all purchases will be donated to Us TOO. There’s no limit to the amount Amazon Smile will donate. CLICK HERE for all of the details. We’ll be sending the December issue of the Hot SHEET newsletter from Us TOO before you know it and more of the latest prostate cancer News You Can Use next month. Enjoy your Thanksgiving celebration and the holiday season!